Russia is part of the greater world whether we are talking about the economy, the spread of information or the development of culture. We do not wish to and cannot isolate ourselves. We hope that our openness will lead to economic and cultural development in Russia while increasing levels of mutual trust, a resource that is in increasingly short supply today. However, we intend to be consistent in proceeding from our own interests and goals rather than decisions dictated by someone else. Russia is only respected and has its interests considered when the country is strong and stands firmly on its own feet. Russia has generally enjoyed the privilege of conducting an independent foreign policy and this is what it will continue to do. In addition, I am convinced that global security can only be achieved through cooperation with Russia rather than by attempts to push it into the background, weaken its geopolitical position or compromise its defenses. A constant theme in Russian history is the fear of isolation and encirclement by its enemies. This has been true since the time of the Mongol invasion of the 13th century, a catastrophic event that saw the early state of Rus lose most of its territory to the Mongols and to the Polish/Lithuanian kingdom. Subsequently, what was left of Russia had to pay tribute in slaves and treasure to the Tatars, the Muslim successors to the Mongols and fight off attempted invasions by the Swedes and the Teutonic Knights. The Russians were unable to evict the Mongols from their territory until the 15th century, and Russia's historic payment of tribute and later conflict with Muslim states is something that should be kept in mind. Russia's northern latitude and climate has also been a source of isolation, withmany of Russia's early ports freezing over for part of the year. As before, I believe that the major principles necessary for any feasible civilization include inalienable right to security for all states, the inadmissability of the excessive use of force, and the unconditional observance of the basic principles of international law. To neglect any of these principles can only lead to the destabilization of international relations. It is through this prism that we perceive some aspects of U.S. and NATO conduct that contradict the logic of modern development, relying instead on the stereotypes of a bloc-based mentality. Everyone understands what I am referring to - an expansion of NATO that includes the deployment of new military infrastructure with U.S.-drafted plans to establish a missile defense system in Europe. I would not touch on this issue if these plans were not conducted in close proximity to Russian borders, if they did not undermine our security and global stability in general. Our arguments are well known, and I will not spell them out again. Regrettably, our Western partners are unresponsive and have simply brushed our concerns aside. We are worried that although the outline of our "new" relations with NATO are not yet final, the alliance is already providing us with "facts on the ground" that are counterproductive to building mutual trust. At the same time, this approach will backfire with respect to global objectives, making it more difficult to cooperate on a positive agenda and will impede any constructive realignment in international relations. The recent series of armed conflicts started under the pretext of humanitarian aims is undermining the time-honored principle of state sovereignty, creating a moral and legal void in the practice of international relations. It is often said that human rights override state sovereignty. This is undoubtedly true - crimes against humanity must be punished by the International Court. However, when state sovereignty is too easily violated in the name of this provision, when human rights are protected from abroad and on a selective basis, and when the same rights of a population are trampled underfoot in the process of such "protection," including the most basic and sacred right - the right to one's life - these actions cannot be considered a noble mission but rather outright demagogy. It is important for the United Nations and its Security Council to effectively counter the dictates of some countries and their arbitrary actions in the world arena. Nobody has the right to usurp the prerogatives and powers of the UN, particularly the use of force with regard to sovereign nations. This concerns NATO, an organization that has been assuming an attitude that is inconsistent with a "defensive alliance." These points are very serious. We recall how states that have fallen victim to "humanitarian" operations and the export of "missile-and-bomb democracy" appealed for respect for legal standards and common human decency. But their cries were in vain - their appeals went unheard. It seems that NATO members, especially the United States, have developed a peculiar interpretation of security that is different from ours. The Americans have become obsessed with the idea of becoming absolutely invulnerable. This utopian concept is unfeasible both technologically and geopolitically, but it is the root of the problem. By definition, absolute invulnerability for one country would in theory require absolute vulnerability for all others. This is something that cannot be accepted. Many countries prefer not to be straight about this for various reasons, but that's another matter. Russia will always call things as it sees them and do so openly. I'd like to emphasize again that violating the principle of unity and the inalienable right to security - despite numerous declarations committing to it - poses a serious threat. Eventually these threats become reality for those states that initiate such violations, for many reasons. During the 15th, 16th and 17th centuries, Russia's biggest rivals were various combinations of three powers - Lithuania, Poland, and the Ukraine. Part of the animus was religious, since all three countries were strongly Catholic while Russia was Eastern Orthodox, a result of Russia's early exposure to Byzantine culture. In 1610, the Poles actually entered Moscow and sacked it, and it was three years before the Russians were able to expel them. Ever since,Russia has regarded countries like Poland, the Baltic States, Romania and the Ukraine the way China sees its own 'near abroad' of Southeast Asia, Mongolia and Korea..as areas it needed to keep under control to prevent being invaded by its enemies. Russia has been invaded twice in relatively modern times - in 1812 by Napoleon and in 1941 by Hitler - with devastating results. They've always sought to have direct or at least a degree of political control over these countries, something the break up of the Soviet Union deprived them of. A degree of paranoia has always been part of the Russian psyche, and seeing Poland, all three Baltic States, Bulgaria and Romania all as NATO members, not to mention Muslim Turkey whom they've fought wars with in the past feeds it, as well as NATO feelers towards the Ukraine and Georgia. Rightly or wrongly, they see this as encirclement. Two other recent events Putin almost certainly has in mind involve the bombing of Russia's traditional ally Serbia and the UN's unilateral declaration of Kossovo as a state in defiance of all previous international law precedents, and the UN involvement in Libya. A year ago the world witnessed a new phenomenon - nearly simultaneous demonstrations against authoritarian regimes in many Arab countries. The Arab Spring was initially received with hope for positive change. People in Russia sympathized with those who were seeking democratic reform. However, it soon became clear that events in many countries were not following a civilized scenario. Instead of asserting democracy and protecting the rights of the minority, attempts were being made to depose an enemy and to stage a coup, which only resulted in the replacement of one dominant force with another even more aggressive dominant force. Foreign interference in support of one side of a domestic conflict and the use of power in this interference gave developments a negative aura. A number of countries did away with the Libyan regime by using air power in the name of humanitarian support. The revolting slaughter of Muammar Gaddafi - not just medieval but primeval - was the manifestation of these actions. No one should be allowed to employ the Libyan scenario in Syria. The international community must work to achieve an internal Syrian reconciliation. It is important to achieve an early end to the violence no matter what the source, and to initiate a national dialogue - without preconditions or foreign interference and with due respect for the country's sovereignty. This would create the conditions necessary to introduce the measures for democratization announced by the Syrian leadership. The key objective is to prevent an all-out civil war. Russian diplomacy has worked and will continue to work toward this end. Putin is being fairly disingenuous in the last paragraph.Russia's interest coincides with Iran's to preserve the status quo. But he correctly points out the hypocrisy of the UN's 'responsibility to protect' doctrine being used to protect European oil interests under the guise of 'human rights'. And one more point. It appears that with the Arab Spring countries, as with Iraq, Russian companies are losing their decades-long positions in local commercial markets and are being deprived of large commercial contracts. The niches thus vacated are being filled by the economic operatives of the states that had a hand in the change of the ruling regime. One could reasonably conclude that tragic events have been encouraged to a certain extent by someone's interest in a re-division of the commercial market rather than a concern for human rights. Be that as it may, we cannot sit back watch all this with Olympian serenity. We intend to work with the new governments of the Arab countries in order to promptly restore our economic positions. 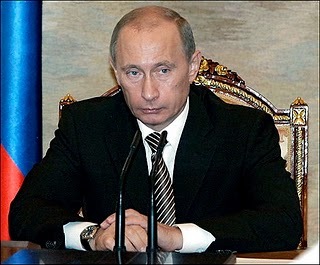 Putin is honest enough to state the obvious, that the Libyan intervention occurred because European countries abrogated their oil contracts with Khaddaffi and signed new ones with the rebels when they thought the rebels were winning, and then had to intervene militarily to save the new deals once Khaddaffi recovered and drove the rebels back to Benghazi. He also is honest enough to bring up the fact that Russia's interest in the region is commercial, and that he has no intention of allowing those interests to be sidelined.He insists on Russia having a slice of the pie. Russia has always had good relations with the moderate representatives of Islam, whose world outlook was close to the traditions of Muslims in Russia. We are ready to develop these contacts further under the current conditions. We are interested in stepping up our political, trade and economic ties with all Arab countries, including those that, let me repeat, have gone through domestic upheaval. Moreover, I see real possibilities that will enable Russia to fully preserve its leading position in the Middle East, where we have always had many friends. As for the Arab-Israeli conflict, to this day, the "magic recipe" that will produce a final settlement has not been invented. It would be unacceptable to give up on this issue. Considering our close ties with the Israeli and Palestinian leaders, Russian diplomacy will continue to work for the resumption of the peace process both on a bilateral basis and within the format of the Quartet on the Middle East, while coordinating its steps with the Arab League. I think the Chechens would disagree with the part about good relations, but there's no doubt that Russia sees itself as outside looking in when it comes to the Sunni autocracies. In view of the current fecklessness of the current American administration, this is his way of serving notice that he and Russia are more than prepared and willing to take over America's role in the region. The notion of "soft power" is being used increasingly often. This implies a matrix of tools and methods to reach foreign policy goals without the use of arms but by exerting information and other levers of influence. Regrettably, these methods are being used all too frequently to develop and provoke extremist, separatist and nationalistic attitudes, to manipulate the public and to conduct direct interference in the domestic policy of sovereign countries. There must be a clear division between freedom of speech and normal political activity, on the one hand, and illegal instruments of "soft power," on the other. The civilized work of non-governmental humanitarian and charity organizations deserves every support. This also applies to those who actively criticize the current authorities. However, the activities of "pseudo-NGOs" and other agencies that try to destabilize other countries with outside support are unacceptable. I'm referring to those cases where the activities of NGOs are not based on the interests (and resources) of local social groups but are funded and supported by outside forces. There are many agents of influence from big countries, international blocks or corporations. When they act in the open - this is simply a form of civilized lobbyism. Russia also uses such institutions - the Federal Agency for CIS Affairs, Compatriots Living Abroad, International Humanitarian Cooperation, the Russkiy Mir Foundation and our leading universities who recruit talented students from abroad. However, Russia does not use or fund national NGOs based in other countries or any foreign political organizations in the pursuit of its own interests. China, India and Brazil do not do this either. We believe that any influence on domestic policy and public attitude in other countries must be exerted in the open; in this way, those who wish to be of influence will do so responsibly. This is Putin reaching out to Egypt and other countries who feel threatened by foreign funded NGOs they feel are fomenting dissension and political unrest. That list,by the way,includes Israel.It's also worth noticing whom he pairs Russia with in the top of that last paragraph. Today, Iran is the focus of international attention. Needless to say, Russia is worried about the growing threat of a military strike against Iran. If this happens, the consequences will be disastrous. It is impossible to imagine the true scope of this turn of events. I am convinced that this issue must be settled exclusively by peaceful means. We propose recognizing Iran's right to develop a civilian nuclear program, including the right to enrich uranium. But this must be done in exchange for putting all Iranian nuclear activity under reliable and comprehensive IAEA safeguards. If this is done, the sanctions against Iran, including the unilateral ones, must be rescinded. The West has shown too much willingness to "punish" certain countries. At any minor development it reaches for sanctions if not armed force. Let me remind you that we are not in the 19th century or even the 20th century now. Developments around the Korean nuclear issue are no less serious. Violating the non-proliferation regime, Pyongyang openly claims the right to develop "the military atom" and has already conducted two nuclear tests. We cannot accept North Korea's nuclear status. We have consistently advocated the denuclearization of the Korean Peninsula - exclusively through political and diplomatic means -- and the early resumption of Six-Party Talks. However, it is evident that not all of our partners share this approach. I am convinced that today it is essential to be particularly careful. It would be inadvisable to try and test the strength of the new North Korean leader and provoke a rash countermeasure. Allow me to recall that North Korea and Russia share a common border and we cannot choose our neighbors. We will continue conducting an active dialogue with the leaders of North Korea and developing good-neighborly relations with it, while at the same time trying to encourage Pyongyang to settle the nuclear issue. Obviously, it would be easier to do this if mutual trust is built up and the inter-Korean dialogue resumes on the peninsula. The probable future of Afghanistan is alarming. We have supported the military operation on rendering international aid to that country. However, the NATO-led international military contingent has not met its objectives. The threats of terrorism and drug trafficking have not been reduced. Having announced its withdrawal from Afghanistan in 2014, the United States has been building, both there and in neighboring countries, military bases without a clear-cut mandate, objectives or duration of operation. Understandably, this does not suit us. Russia has obvious interests in Afghanistan and these interests are understandable. Afghanistan is our close neighbor and we have a stake in its stable and peaceful development. Most important, we want it to stop being the main source of the drug threat. Illegal drug trafficking has become one of the most urgent threats. It undermines the genetic bank of entire nations, while creating fertile soil for corruption and crime and is leading to the destabilization of Afghanistan. Far from declining, the production of Afghan drugs increased by almost 40% last year. Russia is being subjected to vicious heroin-related aggression that is doing tremendous damage to the health of our people. The dimensions of the Afghan drug threat make it clear that it can only be overcome by a global effort with reliance on the United Nations and regional organizations - the Collective Security Treaty Organization, the Shanghai Cooperation Organization and the CIS. We are willing to consider much greater participation in the relief operation for the Afghan people but only on the condition that the international contingent in Afghanistan acts with greater zeal and in our interests, that it will pursue the physical destruction of drug crops and underground laboratories. Invigorated anti-drug measures inside Afghanistan must be accompanied by the reliable blocking of the routes of opiate transportation to external markets, financial flows and the supply of chemical substances used in heroin production. The goal is to build a comprehensive system of anti-drug security in the region. Russia will contribute to the effective cooperation of the international community for turning the tide in the war against the global drug threat. It is hard to predict further developments in Afghanistan. Historical experience shows that foreign military presence has not brought it serenity. Only the Afghans can resolve their own problems. I see Russia's role as follows - to help the Afghan people, with the active involvement of other neighboring countries, to develop a sustainable economy and enhance the ability of the national armed forces to counter the threats of terrorism and drug-related crime. We do not object to the process of national reconciliation being joined by participants of the armed opposition, including the Taliban, on condition they renounce violence, recognize the country's Constitution and sever ties with al-Qaeda and other terrorist groups. In principle, I believe it is possible to build a peaceful, stable, independent and neutral Afghan state. The instability that has persisted for years and decades is creating a breeding ground for international terrorism that is universally recognized as one of the most dangerous challenges to the world community. I'd like to note that the crises zones that engender a terrorist threat are located near the Russian borders and are much close to us than to our European or American partners. The United Nations has adopted the Global Counter-Terrorism Strategy but it seems that the struggle against this evil is conducted not under a common universal plan and not consistently but in a series of responses to the most urgent and barbarian manifestations of terror - when the public uproar over the impudent acts of terrorists grows out of proportion. The civilized world must not wait for tragedies like the terrorist attacks in New York in September 2001 or another Beslan disaster and only then act collectively and resolutely after the shock of such cases. I'm far from denying the results achieved in the war on international terror. There has been progress. In the last few years security services and the law-enforcement agencies of many countries have markedly upgraded their cooperation. But there is still the obvious potential for further anti-terrorist cooperation. Thus, double standards still exist and terrorists are perceived differently in different countries - some are "bad guys" and others are "not so bad." Some forces are not averse to using the latter in political manipulation, for example, in shaking up objectionable ruling regimes. All available public institutions - the media, religious associations, NGOs, the education system, science and business - must be used to prevent terrorism all over the world. We need a dialogue between religions and, on a broader plane, among civilizations. Russia has many religions, but we have never had religious wars. We could make a contribution to an international discussion on this issue. Putin is exercising a little selective outrage here. Russia has certainly seen fit to punish certain countries on occasion, notably Western Europe and the Ukraine when it comes to using Russia's control of energy pipelines to blackmail them, among other things. And that's just the most recent history. Also, the IAEA is frankly not to be trusted when it comes to Iran's nukes - it ignored them for years back when El-Baradi was running it. Putin here is mainly concerned with preserving a good, paying customer. But Putin's totally correct about the intervention in Libya sending a message that illegal nuclear proliferation pays off if you're an authoritarian regime that wants to stay in power. The lesson of what happened to Khaddaffi was not lost on a number of the world's bad actors, including Iran. In the next two sections, Putin talks about expanding its relationships with the BRIC bloc (Brazil, Russia, China and India) via the Shanghai Cooperative Organization (SCO), of which Iran is a observer member as is India. You may remember reading about this important but little known organization on these pages before. In recent years a good deal has been done to develop Russian-American relations. Even so, we have not managed to fundamentally change the matrix of our relations, which continue to ebb and flow. The instability of the partnership with America is due in part to the tenacity of some well-known stereotypes and phobias, particularly the perception of Russia on Capitol Hill. But the main problem is that bilateral political dialogue and cooperation do not rest on a solid economic foundation. The current level of bilateral trade falls far short of the potential of our economies. The same is true of mutual investments. We have yet to create a safety net that would protect our relations against ups and downs. We should work on this. Nor is mutual understanding strengthened by regular U.S. attempts to engage in "political engineering," including in regions that are traditionally important to us and during Russian elections. As I've said before, U.S. plans to create a missile defense system in Europe give rise to legitimate fears in Russia. Why does that system worry us more than others? Because it affects the strategic nuclear deterrence forces that only Russia possesses in that theatre, and upsets the military-political balance established over decades. The inseparable link between missile defense and strategic offensive weapons is reflected in the New START treaty signed in 2010. The treaty has come into effect and is working fairly well. It is a major foreign policy achievement. We are ready to consider various options for our joint agenda with the Americans in the field of arms control in the coming period. In this effort we must seek to balance our interests and renounce any attempts to gain one-sided advantages through negotiations. In 2007, during a meeting with President Bush in Kennebunkport, I proposed a solution to the missile defense problem, which, if adopted, would have changed the customary character of Russian-American relations and opened up a positive path forward. Moreover, if we had managed to achieve a breakthrough on missile defense, this would have opened the floodgates for building a qualitatively new model of cooperation, similar to an alliance, in many other sensitive areas. It was not to be. Perhaps it would be useful to look back at the transcripts of the talks in Kennebunkport. In recent years the Russian leadership has come forward with other proposals to resolve the dispute over missile defense. These proposals still stand. I am loath to dismiss the possibility of reaching a compromise on missile defense. One would not like to see the deployment of the American system on a scale that would demand the implementation of our declared countermeasures. You can see that Putin is fairly adamant about the idea of missile defense not being introduced into Europe by America. And with the implementation of that ridiculous START treaty President Obama is so proud of. Most of the Russian nuclear arsenal is outmoded, and the START treaty involved the Russians trading the phasing out of those old, outmoded nukes from the Cold War era on a parity basis for America dismantling state-of-the-art nuclear weaponry and missile defense. I wrote at the time that President Obama gave up everything but the beer concession at Redskins games. As Russian Foreign Minister Serge Lavrov said, "This treaty takes our relations with the United States to a qualitatively new level of equality, parity and balance of interests." Part of the entire deal was a 'reset' of US-Russia relations and a quid pro quo of help on Iran - which of course never happened. But Putin no doubt felt obligated to put the best spin on this....especially the part about commercial relations, which Russia desperately needs. Besides, if President Obama happens to get re-elected again, Putin presenting himself as willing to make more one sided deals 'for just a few more concessions' can hardly hurt. This article will tell you a great deal about where Putin and the Russians stand and what motivates them. I urge you to read it for yourself. i don't share ff enthusiasm for this article. to me it is just russian speechifying, as opposed to what comes out of deecee. i don't see an issue in this speech that ff has not addressed at some time in the past here at J/P. that puken has offered a condensed version of these subjects, does nothing for me. imo, the reason puken did this is because the chinese have released position papers on the mid-east and are positioning theirselves for seats at the table. and with the chinese and russians and the current occupant of the white house you know who's coming in last in that line-up. i'll give a specific example of why this article is pale. ff addressed the subject matter but from a different perspective. when puken addresses the situation in libya he is correct and even comes across as a (gasp) capitalist. however, the companies he's referring to a russian arms companies. he doesn't say that. also, when referring to the russian nuke, he says nothing of the fact that the russians worked on this, in secret for 10 years, with the iranians until outed in 2003. that's hardly being honest. to me it's just a different version of speechifying. saying look at me, i'm relevant. First of all Putin is relevant, just as Obama is - because they have power. Second, I think you perhaps didn't quite get what I was going for here. This was an attempt to see these issues not from our point of view, but from Putin's and the Russians' and to do that, you have to understand the history and how it has influenced them. Putin was actually a lot more revealing than he realized, IMO. But you have to be prepared to read between the lines. Of course the Russians worked with Iran on this for a decade! But to see why, you have to look at their historic paranoia and fear of encirclement. Think about it...would America help Mexico or Nicaragua or Columbia get the bomb? We'd think it too risky, it wouldn't occur to us - but it DID occur to the Russians, and for the same reason they tried to have their puppet Mossadegh make Iran into a Soviet satellite back in the 1950's. Very interesting, thank you Rob for posting. Just One More Question, Mr. President..
What Your Tatooo Location Says About You..
"Is It Terrorism When Israel Does It?"